Stepping back in time again, let's have a look at the other of the two Barraki (besides Takadox) who I found still on sale once the 2008 line had jazzed me all up for Bionicles. The deadliest and most ruthless of the Barraki warlords, Pridak rules through fear. 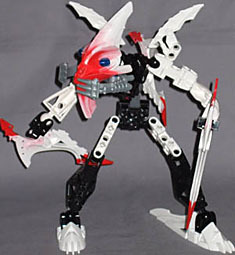 With his shark-like teeth and sea squid launcher, he leads his legions of Takea sharks against Mahri Nui and the Toa who dare defend it. Okay, he rules through fear - so what do the other Barraki rule by, democratic mandate? Maybe whoever it is the Barraki rule are just stuck with a two party system, and it never occurred to any of the Toa to run for office, so the choice is just one warlord or another. I bet the negative campaign ads get really nasty. For those interested in the backstory of these guys, Mahri Nui is a settlement that sank into the ocean, coincidentally coming to rest right next to "The Pit," where all the Bionicles' meanest criminals get sent to make license plates until their appeals come up. Y'know what, it sounds like it's a bit jinxed. There's no kind way of saying it, Pridak is a freaky-looking critter. 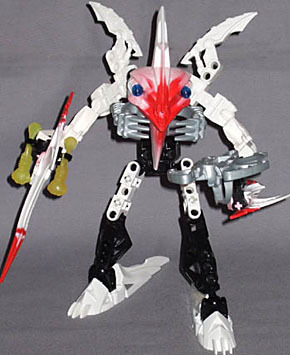 Like Takadox he doesn't have a standard Bionicle body design, relying on a custom-built hodgepodge of parts instead, but his is even more strange-looking, with narrow hips connecting to a smallish upper body with a colossal blade protecting its "spine," arms sprouting from the sides near the back, and the neck sticking out horizontally forward from the chest. Besides the standard joint allocation - balljoints at neck, shoulders, elbows, wrists, hips, knees, ankles - this unique body construction gives Pridak an extra joint, a balljoint waist, which adds a lot of possibilities to posing him, primarily allowing his upper body to tilt drastically forward. Pridak's head - no masks for the Barraki - is extremely animalistic, with the side-mounted eyes and pinched, narrow mouth of a fish, and bonelike crests extending above and below the face. He has the usual Barraki mandibles, which fit in passably well, but the best part is the red colouration that's marbled into the white mask, producing eerie swirls of pink around the sides of the face. The blade pieces - one for the back, two as hands - have the same colouration, with red swirling in at the points, and it makes for a striking colour palette, very reminiscent of the vividly-coloured yet sickly-looking creatures you find in the deep ocean. In construction terms Pridak is eccentric as well. He's basically built like a standard Bionicle, but his proportions are all off, with shorter than usual pieces for the biceps and thighs, and long, ski-like feet. 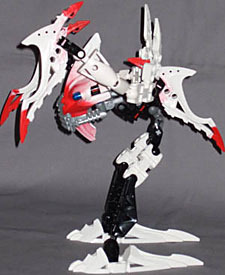 His forearms are actually pieces used for the entire limbs of earlier Bionicles, so they have a (non-mobile) joint part-way along their length, halfway between the actual elbows and wrists. Overall, Pridak is a vicious-looking monster, ideally suited to crouching menacingly, as if he's about to explode into a furious mess of gory knife-edged violence. Like his Barraki comrades, Pridak is armed with a squid launcher, and as usual it's a bit of a joke. The launcher itself is fixed to the side of one "hand," which puts that arm's hand-blade back against the forearm, while the other hand gets a couple of clips attached to either side so it can hold spare squid ammo. See the Takadox review to learn how well the squid launcher works as a weapon; suffice it to say that I doubt there are many Pridaks in the world who haven't been stripped of their silly launchers - he looks plenty lethal with just the blades that nature gave him. If I had to pick just one out of Takadox and Pridak, it'd be Pridak - not that the former is a bad toy (besides the launcher, but they're level on that score), but this guy is a freak, and anyone who likes their bad guys good and monstrous ought to love him.